One coat is all it takes! 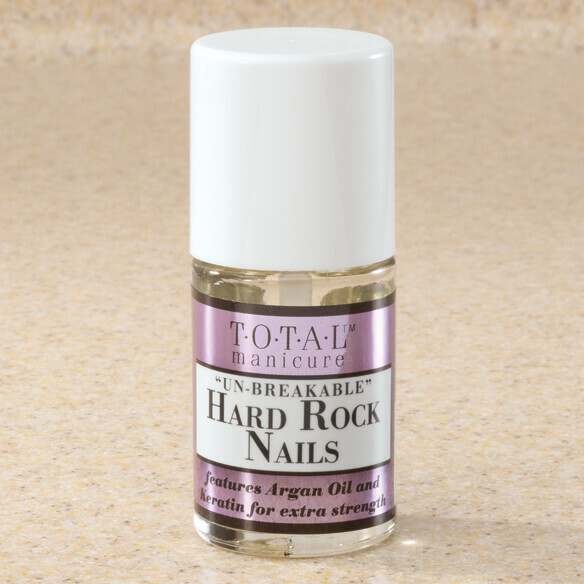 Beautiful, unbreakable nails can be yours with Total Manicure™ Hard Rock Nails. The nail strengthener bonds to your natural nails, forming a rock-hard protective layer to defend against chips, splits and breaks. To use, apply one coat to each nail and let dry. Apply one coat onto each nail and let dry. I am experiencing very weak nails. To lessen cracking/breaking of nails. I keep trying to find ways to keep my nails from breaking. I hope this helps. My aunt showed me this item & she was happy with the product. I have very weak nails and am looking for something to strengthen them. They are a real embarrassment and this product looks like exactly what I'm looking for. I chose this item because I saw the great results my mom achieved after using this product. Her nails look great!!!! I'm hoping this allow my weekly manicure last for a week. For be my nails. They are very brittle and peel alot. Try to save my fingernails. I have naturally long nails so I want to try this nail harder. Is this a spray can with fingernail polish? Can you put colored nail polish over the Total Manicure Hard Rock Nails? I use it as a base coat and as a top coat. My manicures last a week longer when I bring it to the Salon and they use it.